Get a comprehensive tour of Colombo on this half-day excursion. 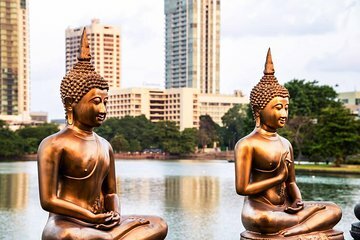 First-time visitors or those short on time in Sri Lanka's capital city will enjoy learning about the city's culture, history, architecture, and modern-day life through guided commentary. Highlights include the Cinnamon Gardens, the Old Parliament, Beire Lake, the National Museum, the Gangarama Seema Malakaya, and other important sites. Nice tour as i was the only one on it, However seeing a elephant chained in a back garden was rather sad, they need company of other elephants or they go nuts At the local zoo a sign said Foreigners 2.500 rupees, locals 500 i wonder what would be said if we did that to Sri Lankan's in England?? Take it down it's racist! I did not go in The tour guide however was excellent and explained a lot about the city its history and religion and culture a very decent Chap! The guide was great but truly there is little to see.